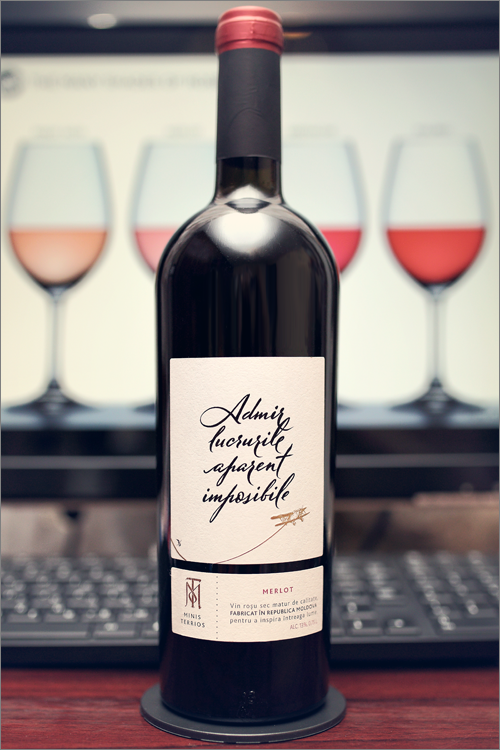 We are tasting Wine of Moldova once again and we’ve decided to try something new, the world’s most underrated grape variety – merlot. The wine that we are going to review is new on the market, a small winemaker with it’s first wine – Merlot 2013 from Minis Terrios. It’s a quite young release for a merlot wine, but it already stole the show on many occasions, so we’ve decided that it is time to try it out. The wine has a very clear and transparent ruby color, with the rim-color of a clear purple shade, which is common for young merlot wines. The nose is clean and strong with no signs of wine faults. The first nose reveals a mixture of blue fruits and a sharp alcohol scent. The dominating aromas are those of sour cherry, wolfberry, red plum, mirabelle prune and pomegranate. The secondary nose brings savory notes of tomato leaf, red pepper, light roasted wood and a hint of prosciutto. The wine is medium dry with some hints of residual sugar, surprisingly, but it has medium alcohol, high acidity and medium tannin, which makes the wine taste flat, a little opulent but lean and crisp, at times even tart. The overall balance is good – the wine is fresh and mellow, with a quite fruity accent, but it still feels a bit to young, with a good ageing potential. The wine has a medium finish with a balanced, a bit acrid, aftertaste. It reminds you of a young malbec and it will be a very good fit with a fat, roasted pork steak or some aged camembert cheese. This is definitely a fine Wine of Moldova and the overall rating says the same, with 88.0 points scored it is right there, among the best wines we’ve tasted so far. Please click on the chart icon on the left in order to get to the wine rating page, where you can find all the wines we’ve tasted to date. Last but not least, we would like to highlight that this is the very first wine from the winemaker’s cellar, a so called ‘en premier’ wine, and to be honest it is a very good one. We would also like to highlight the hard work and the potential of the winemaker who made that wine – a classic example of Moldova’s small wine producers, who made themselves a name in the last decade – young and ambitious, who know what they want, know how to do it and are doing just that, in their own way – ambitions that ads personality to the wines they produce and diversification on the wine shelves, to delight us – consumers. We, on our part, can only admire their drive and determination, enjoy their wine and share it with the ones we love. Nu confundati cuv. mini cu MINIS, ultimul este terroir, dar e in Ro….